2018 Silver Great Britain Queen's Beasts (The Dragon) - 10 oz. The Red Dragon of Wales is the third release in the Queen? S Beasts series from the British Royal Mint. 9999 fine Silver version is stunning in its detail and craftmanship! Each coin comes protected in a mint-issued plastic capsule. Be sure to check out the other releases in this popular series! 2018 10 oz Silver Queen? S Beasts - Red Dragon. The Royal Mint has once again proven its impeccable dedication to producing British coinage that faithfully represents the nation? Third in the immensely popular ten-coin Queen? S Beasts series, The Red Dragon of Wales was designed for the British Royal Mint by the highly respected engraver, Jody Clark. As with previous releases, the intricate detail captured on the image is truly awesome! This magnificent 2018 10 oz Silver Queen? S Beasts - Red Dragon contributes greatly to the centuries of British heritage represented in the 10 original painted-plaster statues of 1953. Minted in high-relief with highest purity and 10 oz weight, this silver bullion coin series has become a highly treasured favorite among collectors and precious metals investors world-wide. S obverse displays Her Majesty Queen Elizabeth II, and the 10 pounds face value. S portrait was also designed by Jody Clark and adopted into British coinage since 2016. The reverse features a stylized and beautifully detailed image of the Red Dragon of Wales. Encircling the rim are the inscriptions, ? 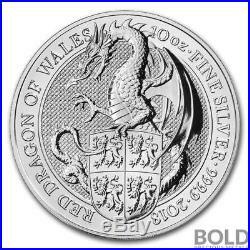 RED DRAGON OF WALES - 10 oz FINE SILVER - 999.9 - 2018. S initials are below and to the right of the shield. S scaled, serpentine body reveals its fierce strength as its size nearly breaks out of the coin? Its face is indeed a fearsome sight! S right claw is extended forward, ready for battle, if required. Its left claw grasps the shield. This is truly a remarkable coin! Third edition of a series of ten coins. Contains 10 troy oz of. Obverse: Displays Her Majesty Queen Elizabeth II. And the 10 pounds face value. Reverse: Features a beautifully detailed image of the fearsome Red Dragon of Wales, the date, and the coin? Sovereign coin backed by the British government. S Beasts are ten heraldic statues depicting the genealogy of Queen Elizabeth II. The statues were created by the British sculptor James Woodford in 1953 for the Queen? S coronation, and temporarily set up in front of the western annex to Westminster Abbey - the coronation church of the British monarchy. Today, the almost 2 meter high painted plaster figures are on display in the Canadian Museum of History in Ottawa. The item "2018 Silver Great Britain Queen's Beasts (The Dragon) 10 oz" is in sale since Friday, March 23, 2018. This item is in the category "Coins & Paper Money\Bullion\Silver\Coins". The seller is "boldpreciousmetals" and is located in Austin, Texas. This item can be shipped to United States.